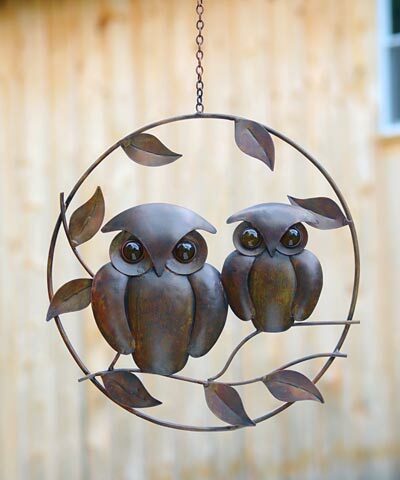 Enjoy watching owls during the day by placing this Ancient Graffiti Hanging Owl Duo Art in your garden. The steel construction, recognizable figures, and brown color scheme lend a unique, artistic look to your home or yard in moments. A 12.75" diameter, metal circle creates the durable frame, and additional rods cross its base and evoke twigs. Leaf shapes adorn the frame, furthering the motif, and the aged copper and brown tones enhance nearby foliage. Two stylized owls rest on the branch shapes, crafted from overlapping steel pieces for dimension and depth. Glass eyes on each bird lend them intent gazes, and a chain at the top of the item allows you to hang it from a bracket or screw in moments. Celebrate owls in a modern way with this Hanging Owl Duo Art.